September began with the 99th annual Dublin City Liffey Swim, a 2.2 K (1.3 mile) “towards the sea” race underneath a dozen key bridges. “A confluence of events has shunted unification on to the political agenda.” From Talk of a united Ireland is rife. But is it a fantasy? The four-volume Cambridge History of Ireland, published in April, received its American launch this month with events in Washington, D.C., New York, and Boston. For a few days early in the month it appeared that U.S. President Donald Trump was going visit Ireland as part of trip to Paris to mark the end of World War I. Within two weeks, the Irish leg was cancelled. “By almost every measure Ireland today is a more inclusive, progressive and safer place to live than it once was, and the oppressive control exerted by church and State have been dramatically lessened. People live longer, cars are safer, roads are better, homes – if you are lucky enough to have one – are warmer and food is better and cheaper than it was.” From Is Ireland a better place to live now than 20 years ago. The BBC reported on the dwindling number of iconic red telephone boxes in Northern Ireland, though some have been re-purposed as mini libraries, defibrillator kiosks, and information centres. Travel to Ireland increased by nearly 8 percent in the eight-months through August, compared to the same period in 2017, the CSO said. 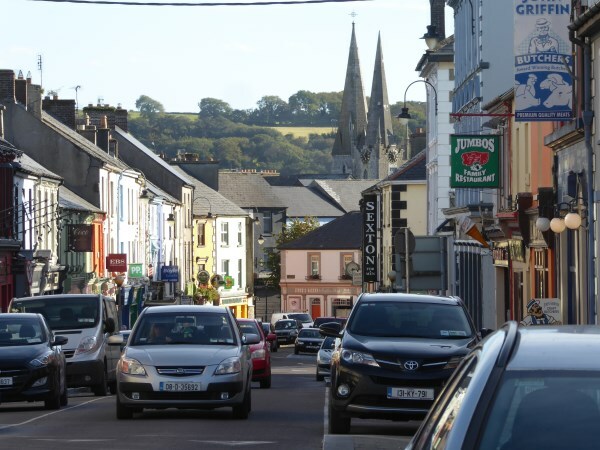 Listowel, in Kerry, the home of the late John B. Keane and the annual “Writer’s Week,” is this year’s All-Ireland Tidy Town, topping 883 entries in the 60th annual competition. “Tidy Town” winner Listowel, from the Listowel Connection blog. This entry was posted in Arts & Culture, Business & Environment, History, Irish America and tagged Donald Trump, dublin, Listowel on September 28, 2018 by admin.